Ink & watercolor illustrations by David A. Bahm. 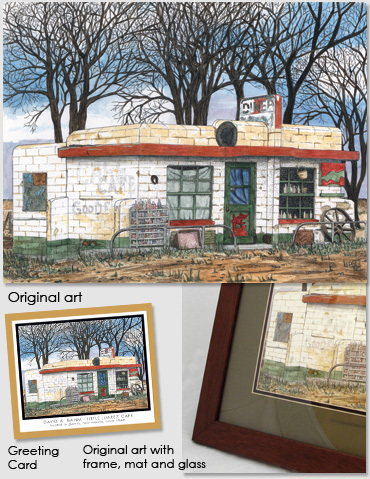 Images below show art, greeting card cover and a portion of the art in its frame, mat and glass. 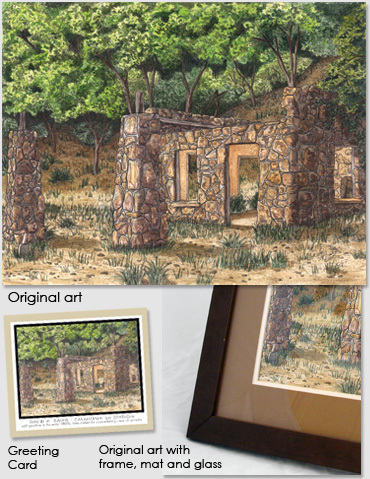 Each original is framed and matted a little differently, but all complement each other. For more information or to purchase, please contact David by e-mail at davebahm@comcast.net or click here. This abandoned station sits east of Arcadia, Oklahoma. It carries a lot of history, including murder and a police bust in the ‘30s for printing counterfeit money in the back room. 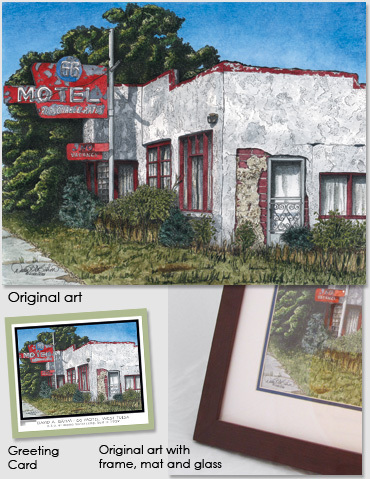 Drawn from a photo my wife took of the 66 Motel in west Tulsa, Oklahoma. We visited during the summer of 2000. Unfortunately this historic motel was demolished sometime in 2001. Original art measures 14" x 11" and was sold in 2016. 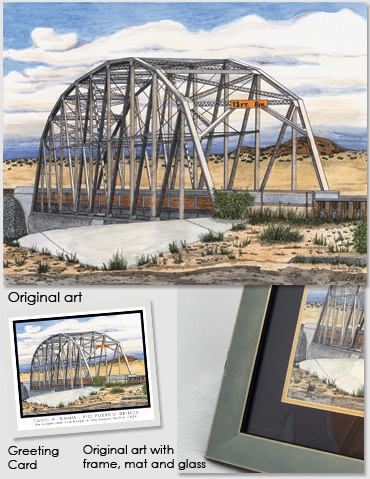 This bridge is located about 15 miles west of Albuquerque. It was built in 1933 and is the longest and oldest surviving steel truss bridge in the state. It was saved from demolition in 1997 and is currently open to foot traffic only. Located in Glenrio, New Mexico, just west of the First Motel/Last Motel in Texas. 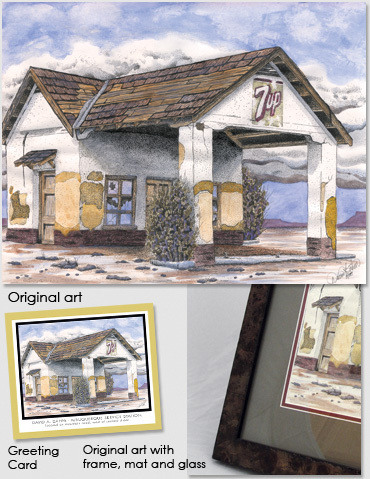 This former gas station is located just north of Route 66 in Albuquerque on Mountain Road. Though it’s not actually on 66, its age and look are reminiscent of the days of the old road. It has been restored and is now an espresso shop. The famous First Motel/Last Motel in Texas, located on the state line of Texas and New Mexico in Glenrio. Original art measures 14" x 11" and was sold in 2017. This house sits on historic Route 66 in Galena, Kansas. With the help of her sons, Ms. Steffleback was believed to have murdered up to 30 of her customers, mostly miners, and relieved them of their bags of gold. Her sons deposited the victms' bodies in nearby mine shafts. She ended up dying in prison in 1909, having never admitting to the murders or disclosing the location of the fortune she amassed. A few local residents plan to refurbish this house and open it as a bed and breakfast. Reference photo courtesy of Mike Callens in Tucumcari, New Mexico. 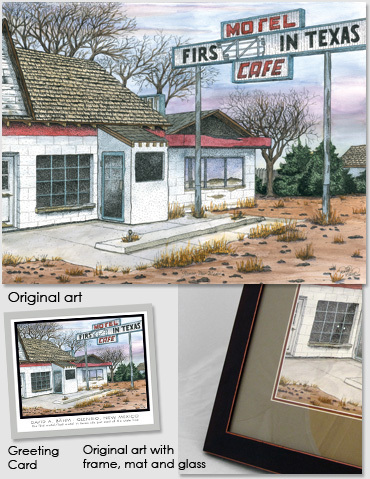 Original art measures 17" x 11" and was sold in 2010. 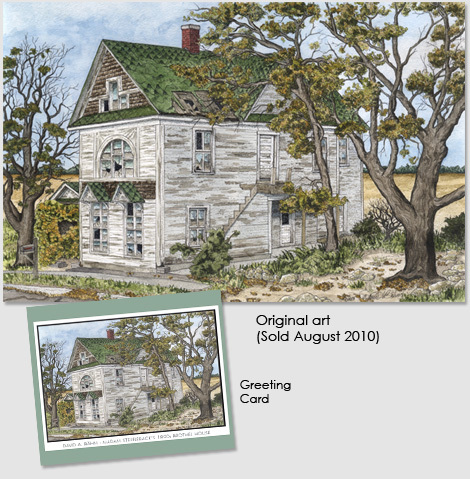 Prints and greeting cards are available.